Hullo fear-conquering warrior! Welcome to this lesson from the Hero's Art Journey, a take-at-your-own-pace e-course for fearful beginning artists, to professionals, to children's book illustrators, and even kids with a parent. The course is based on the premise that creativity is a great healer and guide, and that the best way to learn is through pleasure. It is inspired by elements from Joseph Campbell's work on the "Hero's Journey, and Valerie Frankel's The Heroine's Journey. In this wee gift from the course, we're going to combine two of Campbell's steps in the journey, "The Road of Trials" combined with "Belly of the Whale" – a series of obstacles, trials, tasks or ordeals that the hero must undergo as a beginning step to solve whatever problem or cause, internal or external, prompted consciously or not, their journey in the first place. I've compressed and interpreted these into "befriending or slaying inner monsters or dragons", metaphorically facing fears to overcome what we perceive as our own limitations or things that hold us back and keep us small. Most people have similar monsters, similar fears – the ugly parts of ourselves that we don’t want others to see. Jealousy, bitterness, anger, selfishness, fearfulness, guilt, insecurity, you name it - what are they or better yet what's beneath them? If you look at images of monsters they’re always ugly, alien, malformed, and “other.” What happens if we bring them out into the light so that they don’t have so much power? What happens if we make fun of our fears or tormented experiences (those that we can)? Therapists talk about a process of desensitizing fears by incremental exposure to them. 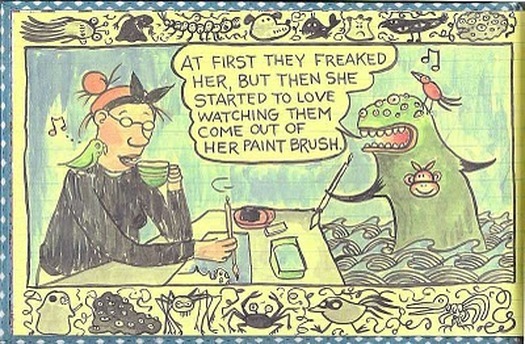 Perhaps drawing our monsters is a first step in doing this. Or perhaps it’s just plain fun. In this project, we’ll be befriending or slaying our inner monsters or dragons by drawing them out, playing with them, and painting them in. You can make it as fierce or playful, or goofy as you like. Directions: Write a list of your fears or past tormented experiences or the things that your inner critical voice says. Think about what your monster or dragon might look like. Start doodling. I invite you to play with these monsters or dragons, to externalize and turn them into art. We can find monsters in films, art, literature, and oral traditions going way back. From really scary to adorable, we live with monsters out in the world and also inside of us. They come in many shapes and forms from many cultures and generally serve to provide analogies for true evil, help explain the unknown or the unknowable, or provide a place for us to project our own inner fears onto. What are our greatest fears? What happens if we name and claim our monsters, these manifestations of our fears to befriend or defuse them? Why do we allow them such power over us? How can we draw them out and set them free from our psyche and unconscious? And now for some inspiration before we get started. Remember, the key is to not worry about painting like Michaelangelo but to see this as a process piece for your eyes only. If you want to share it later, great. If you want to burn it later, also great. The thing is to carve out some personal creative time so that your kid can come out to play and help you get current so that old fears no-longer hold you back. I love Andrice Arp's work, especially her playful monsters. I especially love the simplicity of the shapes in underlying ovals and softened triangles with arms or tentacles or feet sticking out. This one one the right is a group of monochromatic blacks, greys, and whites. I imagine each one means something to her. I encourage you to pay attention to where light is against dark and vice versa, the use of compositional diagonals and where shapes mirror each other. If you'd like to purchase some of her work, visit her Etsy shop. Couldn't resist this fun scary one above left. Note the cool against warm colors, the shading on the right (this means the light is coming from the left), and the small highlights that make this image sing. Andrice also has a fabulous set of Japanese ghosts and monsters paintings here. 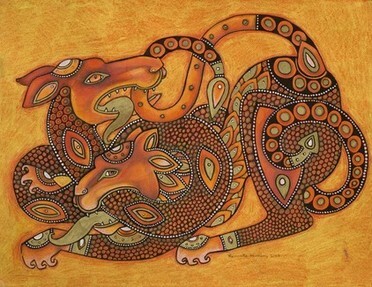 Finally, Lynnette Shelley's Celtic dragon and lion uses either thin acrylic on canvas, or pastels on textured paper, though I suspect it's the former. She describes the symbolism as "In some mythologies, the lion represents physical strength or the physical body, while the serpent or dragon represents wisdom or the intellect. So this artwork personifies the struggles of the physical vs. the intellectual (or heart vs. mind) that we sometimes go through…." Pattern plays a very important role in this piece. She has some other cool stuff in her Etsy shop here. All of us here are survivors of something fearful in our lives and it's totally up to you to look at these on whatever level feels comfortable. At this point in my life, I like to play with my fears whenever possible and transform them into beauty or laughter. I see them as teachers showing me parts of myself that I may not be so comfortable looking at. I like to bring them out into the light of day and claim my ownership that I am stronger than my fears. As creatives, we tend to be on the sensitive side, so look at this project as an opportunity to explore and claim power over our fears or mock and reduce them down to their true size as children's book characters. It's totally up to you. Below are just a few of the many great monster books out there. And lastly, here's a demo on how I made my fear, doubt, and insecurity monster: It felt wonderful to do. HAJ is a 5 week on-demand course that you can take in the comfort of your own home whenever it suits you. It includes lessons in drawing and painting, and is perfect for anyone wanting to explore their creativity, world cultures, beautiful or fun related children's books, historical and contemporary art, and most importantly your own heroic story. During the 5 week (or however long you'd like to take it) course, you'll be doing self-portraits, landscapes, inner Gods, Goddesses or Guardian Angels, and totem animals.